Carl Stellweg takes a close look at the arrests of Palestinian youth, some being held for over a year. Meanwhile, pro-Israeli media claims that parents manipulate their children into resistance. Muhannad Al-Khmur was fifteen when Israeli soldiers first came to fetch him. At three o’clock in the morning they entered his home in Bethlehem and ordered him outside. “Just for ten minutes”, they added, but the boy wasn’t fooled. “I don’t know when you’ll see me again”, he told his mother. The ten minutes turned out to be fifteen months. And even then the army didn’t let go of him. He was arrested a second time and sentenced to eight months imprisonment and a 2000 shekel fine. It must have been a harrowing two-year interlude in his adolescent life, inflicted upon him for the relatively minor offence of throwing stones. Still, the now 20-year-old student seems to have recovered surprisingly well. Fashionable grey cardigan, hands playing with a slick iPhone: it’s a confident looking young man presenting himself at the community centre of a refugee camp near Bethlehem. Almost immediately he bursts into a swift, even mildly humorous account of his experiences with the Israeli military. One could be forgiven to cast some doubt on the truthfulness of this account, but the fact is that Muhannad’s nonchalant delivery is punctured by tellingly wavering moments. When the forty or so days he says he spent in isolation are mentioned, his smooth verbal torrent stalls, his breathing gets heavier, his voice falters. He felt “very sad” in that small, windowless cell, he says timidly. Everything was dirty: the mattress, the toilet, the walls, even the food. When they came to fetch him for the umpteenth interrogation session, it almost felt like being rescued from a choking state of non-being. Muhannad falls mute. An uncomfortable silence ensues. Then his face lits up: sometimes, he says, a “beautiful lady” entered his desolate niche and offered him consolation. In his dreams. The treatment of Palestinian minors by the Israeli military didn’t get much attention until now, but this may be changing. Take the Netherlands, one of Israel’s staunchest allies: a Christian Democrat MP questioned the foreign minister this year about the issue. A report by British lawyers, published last June, prompted him to do so. Coming from a Dutch Christian politician, that’s a first. The British document is hardly unique, though. In 2011 and 2012 the Israeli human rights organisation B’tselem, Defence voor Children International (DCI) and Save the Children issued similar reports on frequent abuses during the arrest, interrogation and detention of minors on the West Bank, 500 to 700 of whom are apprehended yearly, mostly on the suspicion of throwing stones. In a UNICEF report in March similar findings were published, and recently human rights workers released a document concerning alleged mistreatment of children in Hebron in February, March and April this year. Each report mentions that the army frequently arrests children during nightly raids and transfers them to an unknown place for interrogation – blindfolded, their wrists tied behind their backs. The arrests often involve verbal and physical abuse, and unlike their Israeli contemporaries, Palestinian children are denied accompaniment by a parent and legal assistance prior to interrogations. ALSO READ Naava Mashiah: Will Israel ever be part of MENA? What renders the legality of confessions especially questionable is the solitary confinement imposed on an estimated 12% of the children: an unacceptable practice according to UNICEF and other UN-experts, since the UN Convention on the Rights of the Child stipulates that only in extreme cases may the judiciary treat children the same as adults. During the last four years, the Palestinian section of Defence for Children collected 59 affidavits of boys who claim to have spent between one and 24 days in isolation. Often ‘cell 36’ in the Jalameh prison in Israel is evoked: a windowless room measuring two by three meters, with walls of which the rough surface stings in the back. The Israeli Security Service Shin Bet rejects all accusations, but it is unlikely that testimonies about ‘cell 36’ and rough walls that deter leaning could have been collectively fabricated without experienced organisations like B’tselem and DCI getting wind of it. Ayed Abu Eqtaish of the Palestinian DCI section even suspects Israel of a growing penchant for solitary confinement. He mentions the case of a boy who, after 22 days in isolation, called his interrogator “the kindest man I ever met”. In response to the British report the Israeli embassy in London pointed out that Palestinian youth is politicised, which explains its frequent involvement “in acts of militancy and violence”. It is certainly true that Palestinian children were the stone throwing foot soldiers of the first intifada (1987-1993), and that to this day they often lead demonstrations against the military powers. Nabi Saleh, situated high in the hills north of Ramallah, shows where this can lead. In this at first glance insignificant village of 500 people, garlands of empty teargas canisters cynically decorate streets and gardens. On a hazy spring afternoon the neat outlines of the Jewish settlement Halamish can be discerned on a slope opposite. In the valley in between lies a well that used to belong to Nabi Saleh but which settlers confiscated in 2009, with the apparent consent of the occupying powers. Each Friday after prayers, residents of Nabi Saleh gather in protest against this situation. Children – some very young – often lead the marches in the direction of Halamish: waving flags, chanting slogans (‘one two three four, occupation no more’), and yelling at the soldiers blocking their way. The most vocal and defiant ones are proudly displayed on YouTube. Naturally, stone throwing is part of the ritual. The army responds with tear gas, rubber coated steel bullets, or live fire. The situation seems to have evolved into a feud between the Israelis and a Palestinian family, at the expense of children. Most villagers are called Tamimi; the 45-year old teacher and activist Bassem Tamimi is the most celebrated amongst them. For twenty years now he has been taunting the occupiers and he was imprisoned twelve times, mostly on the accusation of “inciting to stone throwing and organising demonstrations without permission’’. The European Union considers Tamimi a human rights defender. Four posters, depicting men of whom only he is still alive, adorn a wall in the living room of Bassem and his wife Nariman. With the unperturbedness that characterises many Palestinians when asked about personal tragedies, she tells how in December 2011 her brother-in-law Mustafa was killed in the village when a teargas grenade was fired at his face, and how her brother Rushdi died in November 2012, not far from her home, after being shot in the back. An uncle killed earlier completes this sad portrait gallery, under which 13-year old Ahed Tamimi has now flopped down onto a couch. From the way she studies her freshly painted nails, one would never guess her status of national heroine. The YouTube video in which she loudly lectures soldiers, with a defiantly clenched little fist, earned her an audience with the Palestinian president Abbas and a Courage Award in Turkey. Pro-Israeli media call this “the cynical manipulation of a child by her parents and politicians”, but the Palestinian side claims there was nothing staged or unnatural about Ahed’s harangue: she had just witnessed her 15-year old brother Waed being taken away blindfolded. That her anger was videotaped was not surprising: the Israeli human rights organisation B’tselem provided Palestinians with video cameras for the purpose of showing the world their plight. Whatever the outcome of the argument, Israel will keep on depicting Bassem Tamimi as an unscrupulous organiser of battalions of indoctrinated stone throwing minors. Unfortunately, this is not a good day to ask critical questions. Nariman’s mobile is stuck to her ear; any moment her husband can be released from yet another stay in prison, in which case he will be home in a few hours. When the message of acquittal finally arrives, there’s little time for tears. 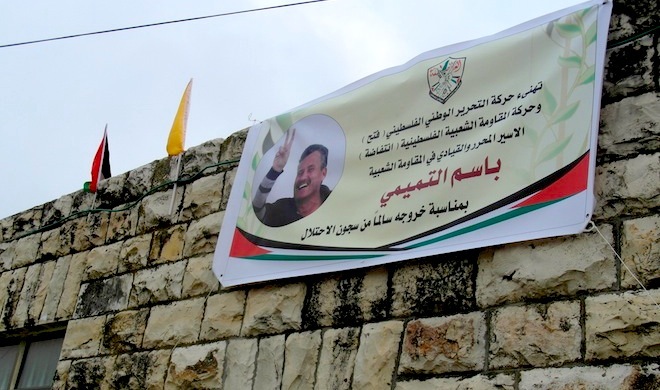 Soon, celebrating villagers mount a poster of Bassem above the front door and plant flags on the roof. The living room gets crowded with relatives. Anan Tamimi (17), too, was incarcerated at the same time as his father, a brother of Bassem. The soldiers ‘released’ him after questioning – handcuffed, and in the middle of the night, in settler territory. Stumbling and trembling with terror Anan found his way home. The yield of three years and four months of resistance in Nabi Saleh: al lot of rhaz (teargas), mattat (rubber) and rassas (bullets). Two martyrs and 117 arrests: dozens of them minors. That grown ups actively involve children in the protests is a fact. That the army targets these children is equally indisputable: it is relatively easy to apprehend them and wrest confessions from them, which in turn facilitates the arrest of adults, since this often happens on the basis of what children blurt out when brought to the brink of mental and physical exhaustion. How did he endure all this? Does he have bad dreams? Many Westerners who consider politics a waste of time and safety the be all and end all (especially for children), may find it hard to grasp that Palestinians see themselves primarily as a community – or nation – in resistance, with no real differentiation between children and adults. Around 750.000 Palestinians have been imprisoned, every single family has been affected. Prison careers often start early in the troubled province of Palestine, prematurely putting an end to childhood. The visit to Nabi Saleh is concluded in the cavernous, icy cold living room of another, heartbreakingly miserable Tamimi home. Enters Islam (16), who gives yet another account of a nightly arrest, brutal questioning, three months in an Israeli prison, threats of deportation to Ramallah, and finally house arrest. How did he endure all this? Does he have bad dreams? On the face of the boy, that didn’t betray any emotion until then, an expression of fathomless disdain appears. “La,’’ he says: no. The views expressed are the author’s and do not necessarily represent those of Your Middle East.